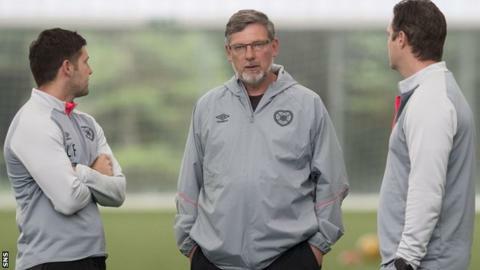 Hearts manager Craig Levein says they will "accept and deal with" whatever punishment they get for fielding an ineligible player against Cove Rangers. The club face an SPFL disciplinary hearing on Monday after Andrew Irving, 18, came on in the 65th-minute of Wednesday's 2-1 League Cup win. The midfielder's new contract had not been registered correctly and Hearts could now face a points deduction. "It gives us a common cause to rally together," said Levein. Hearts owner Ann Budge released a statement on Thursday expressing "embarrassment" for what Levein has described as an "administrative error". She said the club had not uploaded the details of Irving's new deal to the Scottish FA registration system, which meant he was unregistered once his previous contract expired in June. In 2016, Cove were themselves fined £2,000 for naming an ineligible player as an unused substitute in a 4-0 defeat by Alloa Athletic in the same competition. Last season Albion Rovers were thrown out of the Challenge Cup - also an SPFL competition - in addition to their £2,000 fine for fielding Liam McGuigan in a 3-0 win over Spartans. "I don't know if the club has ever been involved in anything like this," said Levein. "It's not something we make a habit of and I don't know how the hearing will go or the possible sanctions. "I know teams have been fined and other teams have been docked points, but it might be different because it's a group section rather than just a straightforward tie." Hearts' win in the first competitive game at the Highland League champions' new Balmoral Stadium put them three points behind Inverness Caledonian Thistle in their group with a game in hand.